P&M Tube Exciter delivers punch, clarity and sparkle to any signal you run through it. 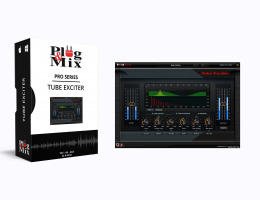 The plug-in features Tube Exciter, Tube Saturation and Sub Bass enhancers which can enrich your sound in subtle and drastic ways. From Broadcast and Live P.A. systems, to recording Guitars, Vocals and Bass, to Mixing and Mastering your songs. Lows : For extended low end enhancement. Center Freq : Adjusts center frequencies to find your mid-range “sweet spot”. Highs: Adjusts the amount of high frequency output. Push : Non-linear tube saturation effect, the main distortion stage of the plugin Sub-Tuning: Dials in the frequency and “bumps” your low end. Sub-Drive : Dials in the amount of Sub Bass. Tube : Soft-knee non-linear saturation effect, applied to output signal. Intended for restoring lost harmonics of heavily compressed material, useful as well to alter the main saturation stage character. Analog : Engages alternative filter models and internal circuit routing for achieving alternative results. Clipper : For limiting your signal’s overall output. Input & Output Meters : Control the overall input and output of the plug-in.